First Novels Club: Double your NaNoWriMo productivity by writing blind. Donna I suddenly learned that I love you. 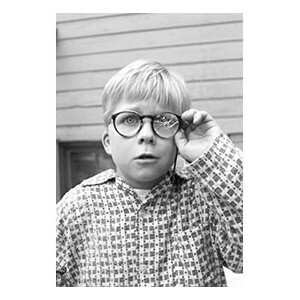 I have only met TWO people in my entire life - that's TWO people in three decades who have worse eyesight than I do. I've got very thin retinas (no holes, whew), floaters, near legal blind (un)vision, bouts of severe SPK and two really mis-matched eyes so that my depth perception is never on. Oh and my attention span is one of a goldfish as well. This is freaking brilliant. I have astigmatism and words are definitely a blurry mess on my computer screen if I take my glasses off. I also am super distraction prone and I have an internal editor that will NOT shut up! So yeah, totally trying this tonight! Ha! No fair if the rest of us haven't memorized Buffy like Frankie has! 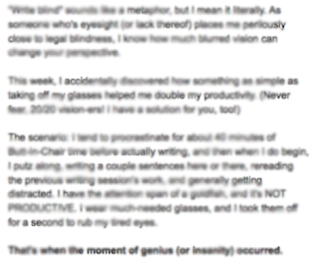 Donna, as someone who's had her share of vision problems (ever heard of Terson's syndrome? And collapsing eyeballs?) I salute you! What a great idea. I'm a whiz at typing. Think I'll try that right now! Oops. Not yet. I won't get the word verification right. Oh my God. This is literally the best tip I have ever read! Honestly, I never thought I would ever stop wasting hours staring at the words I've already written, but now that I can't see them...genius.